Katie said the course on Christology was her favorite part. “Amelie, the consecrated who taught us, was really passionate and taught us to see Jesus as a person, not just some divinity we pray to sometimes,” she said. 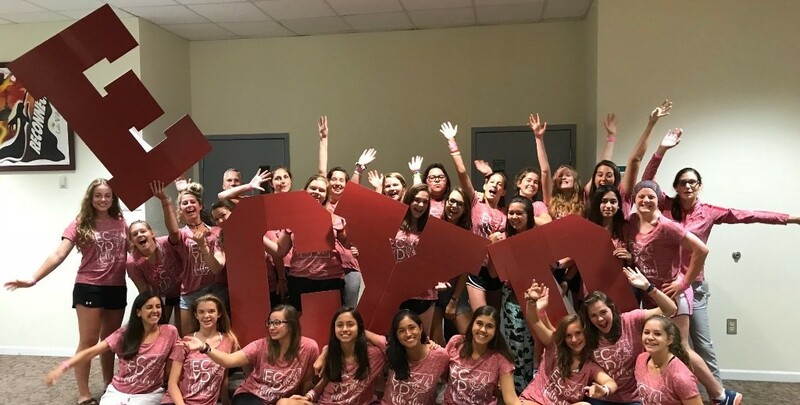 The convention, the first national event of its kind for young ECYD women in about a decade, provided more in-depth formation for existing ECYD members than local camps do, which are often a girl’s introduction to ECYD. It is more formal than a camp, with courses and a dress code and more intentional formation. Every night they enjoyed fun activities. One night there was a murder mystery based on The Greatest Showman, a movie which all the girls loved. Everyone came dressed in character and the whole room was decorated. Another night they put on a talent show, including Fr Andreas Kramarz, LC, the chaplain, who played incredible piano pieces. Once they went out on a hayride and played sports with black light. The classes covered different aspects of the human person: bioethics, Christology, and culture, faith and technology, as well as a course on the charism of ECYD and Regnum Christi and another on affectivity of the heart. They also made; a half-day retreat. One day they engaged in Missions where they preached on the street and did yard work at a seniors’ residence. Katie said the yardwork was enjoyable, even though at home it isn’t a fun activity for her. 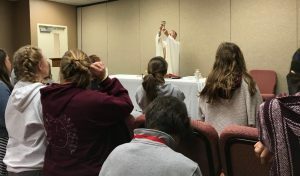 A team of consecrated women and young women in Regnum Christi led the convention. The consecrated were Maria Knuth, Amelie Torre, and Natalia Santos. The young women included Rachael Jacob from Louisiana, Brittany Tover-Hanavan form the Cincinnati area, Sarah Gallivant from Houston, and Mary Peach from Akron. Some moms, such as Corinne Kirkpatrick, also helped. Much of the time, Maria pointed out, those who work with young women’s ECYD have focused on middle-school-aged girls, so this seemed like a good opportunity to do something geared toward ECYD girls in high school. Fr. Andreas liked the results he saw. 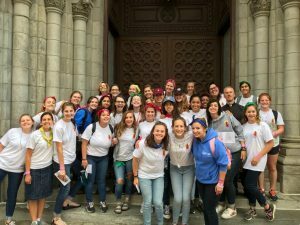 “The girls left very excited to transmit the Gospel to their relatives, to their friends and at school,” he said. Many of the young ladies left eager to share what ECYD was with their teams back home. Others were looking forward to starting Regnum Christi encounter teams. Maddie Nagel said she’ll be using her experience to start an encounter team in the Columbus, OH, area, while Katie Kirkpatrick, a rising junior who is a team leader for fourth-grade girls, said the convention has helped her as a team leader.